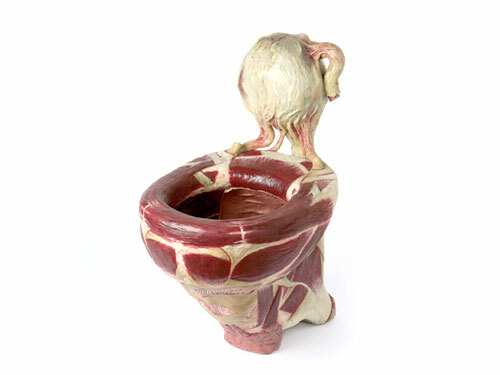 Italian Artist Makes Objects That Look Like Meat | OhGizmo! 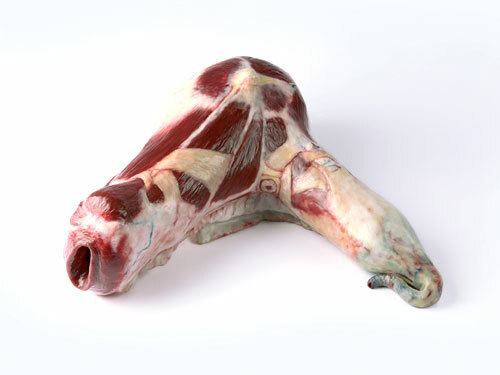 Rarely do you come across artistic genius so keen as to envision everyday objects that look like meat. But that’s exactly what Simone Racheli (an Italian dude) has done. 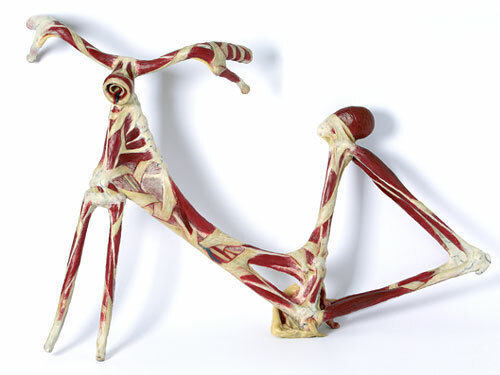 On display at the Paolo Maria Deanesi gallery, his works range from bicycle frames, to irons to delicious toilets. They’re made from plastic, wax and other materials and being works of art, they’re not specifically being sold. Hit the jump for a bunch of pictures and links. Isn’t Simone a girl’s name? And how much classier can you get when you have a guest come to your house and make them sit in your meat chair? For that matter, how awsome would it be to see their face when they stumble upon your meat toilet. Cool stuff. See, that’s exactly why I specified it’s a dude. I agree that Simone is a girls name, but not in Italian. In Italian, they like to add an “e” to names. So, it’s really Simon. But it becomes Simone. My name for instance would be Davide. And I agree, this is the pinnacle of class. You should even sprinkle the stuff with smoke smell. This stuff looks gross. I do not even want to touch it, let alone sit on it. If this is Art…How horrible they’re.Maybe the chair has some nice line style..
Dear god that iron makes me unhappy. Thanks for clarifying that for me David. I agree that the smoke smell would be a nice touch, but if you do that, you might as well make the whole thing smell and taste like bacon, like those bacon breath mints… and if you go that far, it would just make more sense to make the whole thing out of bacon. 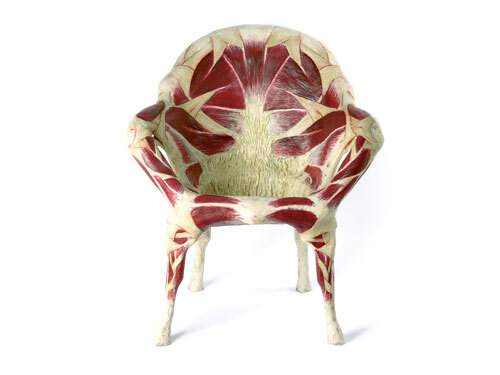 However, by then it stops being a work of art, and more a work of deliciousness, and besides… the whole point of it is to be a normal chair that LOOKS like meat, but without the properties of it. Wow… that was a big rant on nothing… but oh well. That meat chair looks much more comfortable than my lard chair. You should make a football or a beer hat or something typically masculine out of meat. Or maybe a doll or a bra. These pieces are trully disgusting. I don’t know what was in the designer mind when he made them, but I’m really curious. About what Cramulus said, wouldn’t a doll made of meat be a woman? 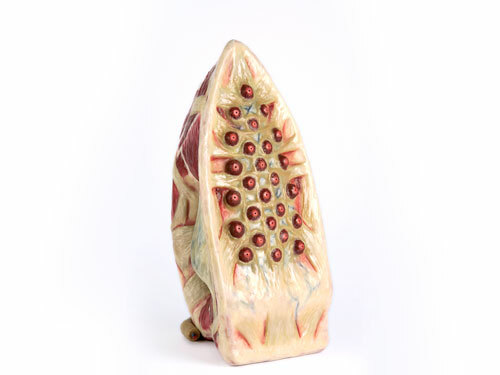 A skinless one perhaps… Either of the human sexes could be a meat doll. To a robot or alien made of something other than meat, humans and other mammals would look like “meat bags”. Anyway, how did the subject get steered in the direction of meat-sculpting? As David(e) already pointed out, the pieces are made “..from plastic, wax and other materials..”. They aren’t made of meat, and why is everyone giving the artist so much flak? I think it’s ingenious! If appliances were living creatures, this is what their insides would look like. It’s a cool concept, much like that living gun from the video game “Prey”. I would totally buy the meatbike, how awesome.